Little changes can make a big, big difference! 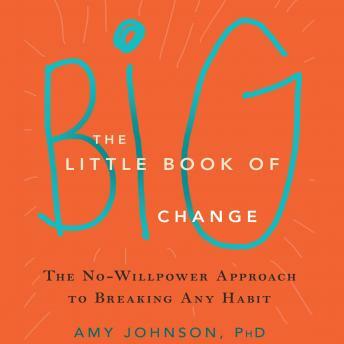 In The Little Book of Big Change, psychologist Amy Johnson shows you how to rewire your brain and overcome your bad habits—once and for all. No matter what your bad habit is, you have the power to change it. Drawing on a powerful combination of neuroscience and spirituality, this book will show you that you are not your habits. Rather, your habits and addictions are the result of simple brain wiring that is easily reversed. By learning to stop bad habits at the source, you will take charge of your habits and addictions for good. Anything done repeatedly has the potential to form neural circuitry in the brain. In this light, habits and addictions are impersonal brain wiring problems that result from taking your habitual thinking as truth, and acting on that thinking in the form of doing your habit—over and over. This book offers a number of small changes you can make in your everyday life that will help you stop your bad habit in its tracks. If you want to understand the science behind your habit, make the decision to end it, and commit to real, lasting change, this book will help you to finally take charge of your life—once and for all.